Something that all of us need from time to time are letter/number decals. Way back when, before there were so many aftermarket decals, we used to use the heck out of these; and many of us still do. 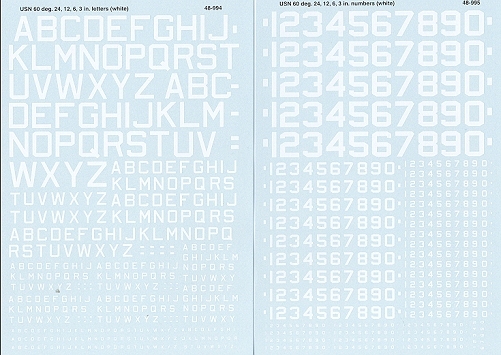 These two sets are for letters and numbers in the USN 60 degree style found on many of the aircraft painted in darker shades; like overall gloss sea blue. These come in 24, 12, 6 and 3 inch heights so can be used for everything from wing numbers to bu/nos. Two very useful sheets and I suggest picking up what you'll need as once they are gone, they are unlikely to be reprinted for a while. If you would like your product reviewed fairly and quickly by a site that has around 300,000 visits a month, please contact me or see other details in the Note to Contributors.